If we get a great DT, a solid OT and 1 more surprise in the late rounds or UDFA at RB or LB or TE, I'll call this a good draft. Beane needs to nail the top 2 picks. I'm not impressed with what he did in the 1st round drafting the 4th best QB at 7 and trading up for a LB when better LB's were still available. I sincerely hope he proves me wrong. Oh and draft a punter. We could use a solid upgrade there to really top off this offseason. I think we have a glaring need at DT and nearly so at OT and DE. Still, Beane did as good a job as you could expect at smoothing out the holes. I'm also expecting another big signing. I think Beane is waiting to see what happens next weekend before deciding on a move like Clowney, Clark or Suh. They can wait until 2020 to draft a highly ranked RB and maybe just draft someone to challenge for a spot behind Shady in 2019. I'd love to see Henderson in Bills blue next year, though. Let's see what he can do at this level. Memphis isn't Alabama, but he sure is fun to watch. Why are you including Whaley in this analysis? It's just insane that so many people are making this mistake. That's a big maybe on Sweat or White, but who knows? I've read that Sweat may have a heart condition. Ouch! Our greatest need is for elite talent, so a trade up would be good too. DT is our weakest position overall followed by OT and G. It could be a long season if the DL doesn't get elite help. They'll have trouble getting off the field. I'd gladly sacrifice some day 3 picks for a top 5 talent that falls. I've wanted Oliver all along. I'll still be happy with Jonah Williams, Q Williams or J Allen if any of them fall unexpectedly. 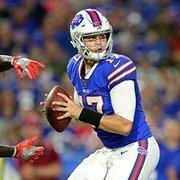 I really hope a couple QB's go before we pick so we can get an elite player. It's starting to look like Oliver will be gone before we pick, though. I wish Thursday night would hurry up and get here. The suspense is killing me. I disagree. You'd be reaching for an offensive playmaker at 9 and we sorely need help on the DL. I hope you're right about Edmunds, but he still has a very long way to go. Hughes is very good, but we really need 2 elite DL at both DT and DE IMO. We have multiple playmakers in the secondary. Gary's production in college doesn't warrant a top 10 pick, but that doesn't mean Beane won't reach for him. After all, he even traded up for Edmunds when he probably could have gotten him in the 2nd and Vander Esch, who is far better, was still on the board. I hope he doesn't make that same mistake again. Allen needs guys that can get separation to limit interceptions on his often off target throws. We are? Why? Maybe one should get a life rather than despair over something as trivial as this. 80% of what all sports publications put out is nonsense. If you don't like it, why on earth did you feel compelled to drag it out further by starting a thread about it? Because we want to reach for a player at a position of need with a top 10 pick? Definitely staying with 7-9 until I see at least 2 elite talents added to this roster. Maybe not #1, but I'd be on board for this. Murray can aim his passes, yes? UGH! Lotulelei and Phillips starting at DT all year? Now there's a recipe for disaster. We'd be one of the worst teams in the NFL against the run.